Meet our grantee partner, Annalise Ophelian! 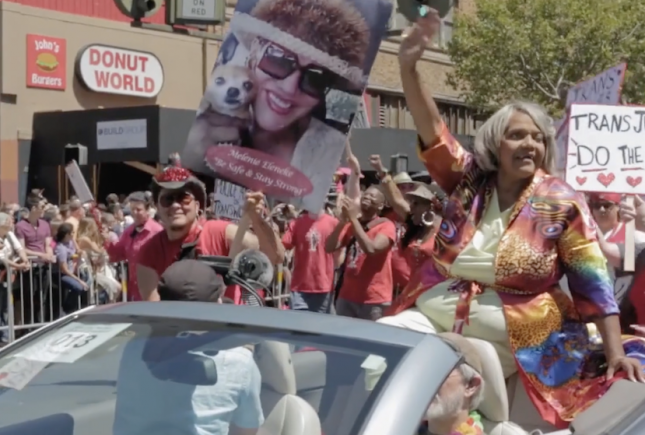 Grantee partner Annalise Ophelian and Miss Major Griffin-Gracy, the subject of Ophelian’s documentary, MAJOR!, discuss the film and what it meant to receive support from Astraea. Today, we are pleased to introduce you to filmmaker and 2015 Global Arts Fund recipient, Annalise Ophelian! Annalise Ophelian is an award-winning filmmaker and the producer/director of the documentary about Miss Major Griffin-Gracy, MAJOR!. She is a white, queer-identified cis woman, psychologist, and consultant whose work includes Diagnosing Difference (2009). Miss Major is a formerly incarcerated Black trans elder and activist who has been fighting for the rights of trans women of color for over 40 years. She is a veteran of the Stonewall Rebellion and a survivor of Attica State Prison, and previously worked as the Executive Director of Astraea grantee partner Transgender Gender Variant Intersex Justice Project (TGIJP) based in San Francisco. In the video above, Ophelian and Miss Major discuss MAJOR! and what it meant to receive support from Astraea. Learn more about Annalise Ophelian and Miss Major. [Director, Annalise Ophelian]: As a queer woman, I feel like my life is lived on a path that Miss Major has paved and I hope that being able to document her life in this film is some small part of paying homage to what I think we all as LGBT folks owe our foremothers. [Trans Activist/Community Leader, Miss Major Griffin-Gracy]: I believe that through this documentary, there is an opportunity for the girls to see we all struggle, you know, and that finally there’s an older transgender person out, proud of who they are, ready to tell you about it. [Annalise Ophelian]: The Astraea Global Arts Fund was really pivotal in the production of this film. That funding was the difference between having a film and not having a film. [Miss Major]: One of the things that happened is, through the blessing of Annalise, I got an opportunity to see me, and to take a breath for a minute: “Wow, I’ve been really busy.” Why I have been doing this over 40 years? It’s because it’s needed to be done this whole 40 years. [Annalise Ophelian]: One of the things that I really love about Astraea is that they don’t just fund, but they’re also so committed to networking. We are really excited to be able to partner with Astraea in terms of just bringing the film to audience.I mean so much of Major’s work is about her personal interaction with community, and the film is a way that Major gets to actually have that connection with folks globally. [Miss Major]: Astraea helping the film was just great. I mean, because it’s like they appreciate Annalise, and by them appreciating her, it meant that they appreciated me. And how wonderful is that to know that somebody appreciates you? [Annalise Ophelian]: I think that film has so, so much power to influence people and to change the world. [Voiceover]: …it will serve as an enduring reminder of our legacy of resilience, of where we are now, and of how far we must move and journey together.